Boneless, rind on shoulder of pork. From trusted farms. Working with selected farmers that we trust, to ensure high welfare standards and consistent quality. This joint is ready to roast with the bone removed, and tied for easier carving. This joint has been hand scored making it ideal for crackling. Instructions: Oven 230oC/Fan 210oC/Gas 8 Place in centre of preheated oven and cook for cooking time on front of pack. After first 30 minutes, reduce oven temperature to 180oC/Fan 160oC/Gas 4 and cook for remaining time. Remove from oven and rest for 10 minutes. Remove strings and crackling, carve and serve. 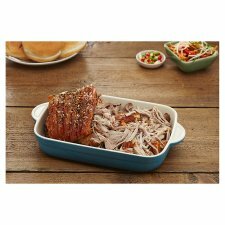 Remove pork from packaging and rest at room temperature for 30 minutes before roasting. Place in a roasting tin and pat dry rind of joint with kitchen paper. Rub rind with a little oil and season generously with salt. Suitable for home freezing. Ideally freeze as soon as possible after purchase but always by the "use by" date shown.